Every single mortgage application that we process is run through an automated underwriting engine in the sky so top speak. The feedback from Fannie Mae, Freddie Mac or FHA will say, "Approve Eligible, Refer with Caution or Refer". In other words "Yes, No or Maybe". .
We call the feedback our findings, and we determine the items we need for the processing of your mortgage on these findings. 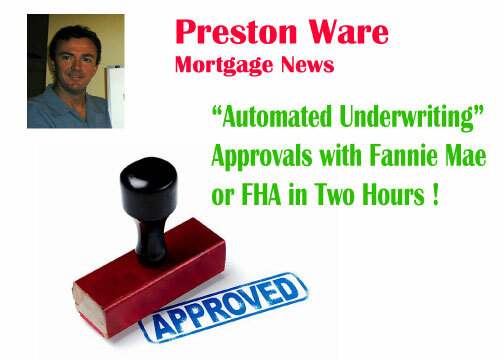 Fannie Mae, Freddie Mac, FHA, USDA all have their own underwriting engines that we access by means of internet based portals. Our mortgage loan originating software uploads your file so the agencies can read and interpret and weigh the good and bad points of your file. The system weighs the guidelines, the strengths and weaknesses. Your credit report is embedded in our file which we upload to the automated underwriting engine. Credit scores ,job history, income, equity in the transaction, reserves, collateral and the latest guidelines are all taken into account and weighed as part of the decision on your loan. I will get your feedback immediately! The underwriting engine will deliver a verdict on your file. It can be Approve/Eligible for Fannie Mae or Accept for Freddie Mac or if it is not too sure about your deal, it will say "Refer Eligible" or "Refer with Caution" or "Refer". Just to make my job more exciting and difficult, each lender has their own proprietary front end system which will alter the Fannie Mae or Freddie Mac parameters and replace it with their own "overlays". A typical example was Wachovia Bank several years ago. Where Fannie Mae would still allow a debt ratio of 55% total debt ratio, Wachovia had an "overlay" of 50%. This may sound tough but they have a right to do this because it is their money. In light of all of the recent foreclosures in our economy, can you really blame them? And just an FYI, that overlay is now 45% with the exception of a few asset based portfolio sources. Another overlay used quite often in today's world is in reference to "flips". FHA has a guideline that a buyer cannot purchase a flip until 91 days after the owner purchased the property. In other words they cannot make an offer on a flipped property until 91 days after the owner bought it. Many FHA lenders have overlays that say, we want the owner in that property for 181 days. Lenders have the right to do this because it is their money. Conversely some sources allow this guideline to be one day, sort of a positive overlay. It is my job to represent the details of your transaction properly when I submit your file on line. A wrong number is a lie and renders your whole case file invalid! If we have one wrong number than we are submitting a lie and our feedback is essentially invalid. It is the lenders job to validate the information I have provided. We validate by showing proof of the numbers I have submitted. We prove income with paystubs, assets with bank statements and credit with a credit report. The bank will examine the validity of the contract as well as study all of the comparables on the appraisal. Most of the problems in todays market are associated with the appraisal in a declining market. If you are buying a short sale this won't matter so much because hopefully your realtor has done his homework and you have made an intelligent offer. There is a lot of talk these days about it being so much more difficult to get a loan. This is true only to a certain extent. Yes, many aggressive " No-Income verified" loan programs have disappeared but we still have plenty of "bread and butter" programs available for the typical customer who can prove income. Where the old minimum credit score for Fha was 580 now it is 640 but I do have sources that are willing to look at less than 640 credit score files under certain conditions. I have included sample findings of a typical file run through Fannie Mae. (DU) The findings will tell us what we need to include to document your loan. Sometimes this will be one or two years of tax returns if your file has a high risk level or if you are a really strong borrower the system will only ask for a year to date paystub and a verbal verification of employment. The risk profile of this loan casefile appears to meet Fannie Mae's guidelines. This loan casefile appears to meet Fannie Mae's eligibility requirements. This recommendation is valid up to a note rate of 5.625 percent. This loan is also subject to all other lender specified conditions and must comply with all applicable federal, state, and local laws and regulations. Based on the credit report obtained through Desktop Underwriter, this loan must close on or before 10/28/2009. All verification documents must be dated within 120 days of the closing date. For new construction, documents must be dated within 180 days of the closing date. If there is a home equity line of credit secured against the subject property, the maximum allowable HCLTV is 95 percent. The HCLTV calculation is based on the maximum credit limit of the equity line. The Adverse Market Delivery Charge will be applied when this mortgage loan is delivered to Fannie Mae. Refer to the Selling Guide and Loan-level Price Adjustment (LLPA) Matrix and Adverse Market Delivery Charge (AMDC) Information on efanniemae.com for specific details. DU identified the following tradeline(s) as disputed by the borrower and did not include the tradeline(s) in the credit risk assessment. The lender must verify the accuracy of the tradeline(s) by determining if it belongs to the borrower and by confirming the accuracy of the payment history. If the tradeline does not belong to the borrower, or the reported payment history is inaccurate, no further action is necessary. If the tradeline does belong to the borrower and the reported payment history is accurate, it must be taken into consideration in the credit risk assessment. To ensure it is considered, the lender may obtain a new credit report with the tradeline no longer reported as disputed and resubmit the loan casefile to DU, or the lender may manually underwrite the loan. If the tradeline is a mortgage that was past due by two or more payments in the last 12 months, or a foreclosure that has been filed within the last 5 years, the loan casefile is ineligible for delivery to Fannie Mae. self-employed income must be supported by one year's signed personal tax returns if it will be used for qualifying purposes. Provide all tax schedules and written permission to request tax returns from the IRS. A minimum of 6 months self-employment income must be reported on the latest tax return. Refer to the Selling Guide for additional information. income must be supported by a paystub and a telephone confirmation of employment, or by a standard Verification of Employment (1005). The paystub must be dated no earlier than 30 days from the application date and it must include at least 30 days of year-to-date earnings. In lieu of obtaining the telephone confirmation, an additional paystub dated within 30 days of closing may be obtained. Verify the net rental income or loss with the borrower's most recent signed federal income tax return (Pages 1, 2 and Schedule E). A copy of the current lease agreement may be used only if the property is not on the Schedule E because it was acquired subsequent to filing the tax returns. If the property is currently the borrower's primary residence, a fully executed lease agreement, receipt of a security deposit, and documented equity in the property of at least 30 percent must be provided. If the total expense ratio already includes the entire rental property payment (i.e., income from the property not considered), no documentation is required. Net rental income is not allowed on second homes and should not be used for income on the subject property. Refer to the Selling Guide for additional information. Assets totaling $49525 must be verified. From the liquid assets listed on the 1003, at a minimum verify those accounts that are needed to satisfy this amount. If depository assets are needed to support the amount of funds required for closing and reserves, verify these assets with a verification of deposit or bank statements covering a one-month period. A satisfactory explanation and documentation should be provided for large deposits. Desktop Underwriter returned the following standardized address and census tract for the subject property This is the address that Desktop Underwriter used in its property valuation and fieldwork recommendation. Regardless of the property fieldwork required by Desktop Underwriter, if this address is not valid for the subject property, an appraisal based on an interior and exterior property inspection reported on Form 1004 is required for this transaction. If the subject property is located in a condominium project, the appraisal must be reported on Form 1073. An appraisal based on an interior and exterior property inspection reported on Form 1004 is required for this transaction. This case was submitted to Desktop Underwriter version 7.1 by ASSOCIATES, L.P.. The following information is associated with this loan: Casefile ID is and Submission number is 1. If the loan is delivered to Fannie Mae, the Casefile ID must be provided at delivery. The following list of special feature codes is provided to assist you in determining which codes may be associated with this loan. Other codes may be required. Refer to the Fannie Mae Selling Guide for a comprehensive list. The following assets were counted towards available funds. With the exception of cash on hand, all available funds greater than the amount required to close have been added to cash reserves. The taxes and insurance payment from the retained REO has been added to the total expense payment used in the total expense ratio.